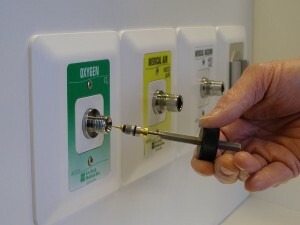 Medical Gas System | Major Medical Hospital Services, Inc.
Major Medical Hospital Services offers a comprehensive high quality medical Gas Services Program designed to efficiently and effectively assist your staff in providing a safe and healthy environment for both patients and employees. We will assess the systems you have in place to determine if they meet current NFPA and Governing Bodies Criteria. We evaluate your maintenance programs to determine if they meet current NFPA and Governing Bodies Criteria. We provide assistance in troubleshooting and/or upgrading existing systems and provide emergency repairs upon request. Our annual preventative maintenance programs are customized to meet your specific needs. We provide in-service programs covering the correct use of the medical air and vacuum systems as well as ancillary suction equipment. Proper use of these systems will reduce the overall operating expense. We provide you with accurate inventories of suction regulators, flow meters, high-pressure regulators, etc. as well as an annual maintenance agreement, all at reasonable costs to you (Suction Program). Our reporting system, detailing both our finding and recommendations, is accepted by the NFPA and Governing Bodies Criteria. Our comprehensive program helps organize and track your system status, upgrades and also meets the reporting criteria dictated by the industry Standards.